I told her that my daughter was solely responsible for packing her own bag as well as making sure that she had everything she needed for school. I explained to her that it was more important for my daughter to learn from her own mistakes and become more mindful about bringing the things she needed for school, rather than have her always depend on an adult. School is supposed to give my daughter the “practice” she needs for real life, and we’ve had our fair share of rushing back home, which is a good half an hour drive to retrieve left project materials, bags and text books. As a mother, my instinct is always to protect my children. Of course I want to see them succeed in everything they do, so it’s painful to watch them make mistakes especially if I know that I can prevent them. But I’ve also realized that by doing this, I deprive her of the opportunity to be strong enough to handle things on her own in the future. So somewhere along the way, I learned about letting go a little bit at a time, and to step in only when safety, integrity or values are concerned. One of the things I have to constantly deal with when it comes to my eldest daughter was cleanliness and orderliness. She was less careful so we had to deal with more spills, cuts, scrapes and ER visits in the past. Because she is our precious first born, she was spoon fed and watched like a hawk. Everyone tried to step in even before she made a mistake. Thus, depriving her of the opportunity to know and learn some things for herself. I had this deep realization after we came home from one of our learning dates overseas. We influence our children in more ways than we can imagine, and what we tell them can become their inner voices as they grow up. I realized that we had to change ourselves if we wanted to see change in our children. That night, I decided to test the theory and put some responsibility on my 7-year old daughter by showing her a little more trust. It takes a village and all kinds of tricks to wake up my eldest daughter, but she woke up extra early the following day excited to do some work in the kitchen. It made me realize that she actually liked having responsibility. It took a great deal of will power on my part not to intervene, hover or instantly clean up every spill as I watched her crack some eggs into a bowl and mix up the batter in a puff of flour. I kept reminding myself that nothing she did couldn’t be resolved with a mop and a dishtowel. Her pancake breakfast was a success. She became better and better at it everyday. 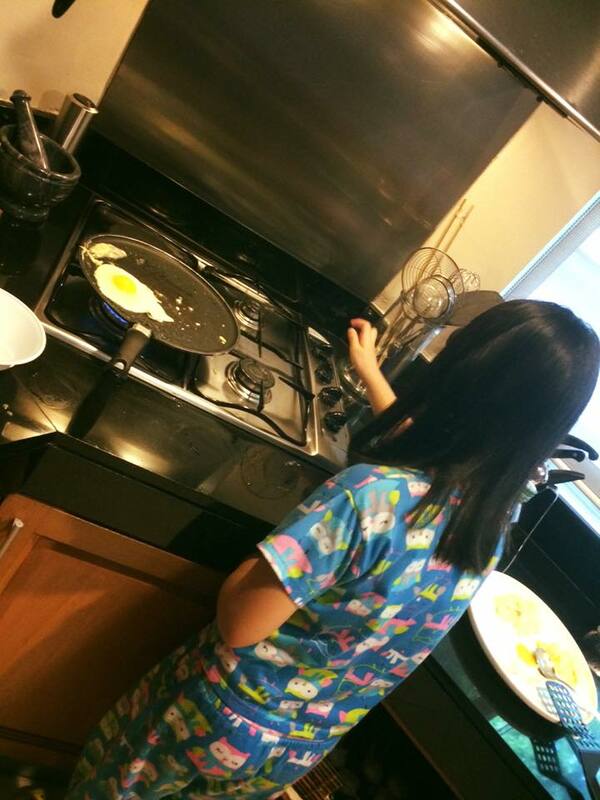 She ended up making breakfast almost every morning that summer. It taught me to trust her more. I discovered that I could trust her with bigger things if I only let her try. It taught her responsibility and order, and because she was tasked to clean up as well, she realized on her own that if she was more careful, she would have less to clean up after. By letting her learn hands on, and allowing her to make the necessary adjustments, she was able to understand the concept of orderliness much faster without needing to nag her about being clean and orderly all the time. The lessons were priceless as I watched my 7-year old take control of my kitchen. Our own fears may be preventing us from giving our children the opportunity to grow, because our fears become their fears as well. When we step in, is it because we just want to safeguard them? Or is it because our own fears get in the way? Do we secretly feel that since they are seen as reflections of us as parents, when they fail, we fail as parents as well? Our children may reflect our attitudes, but they are not our extensions. They are not our possessions. They should be allowed to live their own lives, and pursue their own interests. They are God’s gifts to us. We are merely stewards, or tools that the potter uses to mold his clay. We honestly cannot pre-determine how successful our children will turn out as adults. For this, we rely on God’s grace. While we instill values and principles on our children, we cannot force them to be godly and spirit-filled, God gave everyone the freedom to come to him personally. We can only direct them to the right path while they are young, and we can only hope that we become sensitive to their needs and help encourage them to become what God intends them to be when they grow up. That is our role as parents, to make sure that our children feel loved and accepted despite their mistakes so they are not afraid to try. We can hold them accountable for their choices, yet still love them unconditionally when they make the wrong ones. 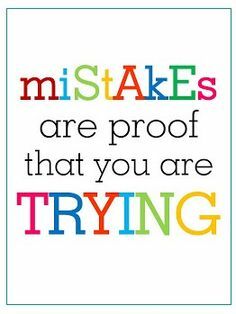 Turn mistakes into learning opportunities, it will help build their self-confidence and resilience for the future. Don’t save them, just help them focus on finding a solution. Instill the habit of taking responsibility for your mistakes by modeling the same behavior. Be a forgiving parent. Be encouraging when they make a mistake, don’t equate mistakes to failures, instead discuss how the same thing can be prevented in the future. Our role in helping children grow is to guide them and help them make better decisions along the way, when they are given accountability for their choices, and they know that they will be loved no matter what, there is no fear of failure or judgment. Really enjoyed your post. I struggle with letting my daughter fail. Great reminder why it is important. I let my kids fail & fall at times but then it’s the angkong and amas who always look at us and make us feel *bad parents* for letting them fall or scrape or cry. Hahaha! !